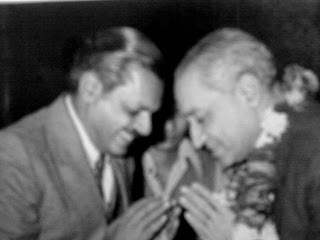 I have one extremely rare photograph of Respected Tauji (Shri Justice Shiv Dayal Ji Shrivastava) and Pitaji (Shri Jagannath Prasad Shrivastava, Advocate), when Tauji had his first visit to Gwalior as Chief Justice of Madhya Pradesh High Court. 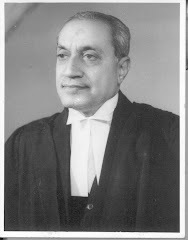 That time respected Pitaji was President of Gwalior Bar Association. Both are offering respect to each other by doing "Namastey". One lawyer said these are two brothers and on this respected Pitaji's reply was "No it is Bar Association President who is welcoming the Chief Justice. If it were two brothers, then the younger one would have been touching the feet of elder and the elder one would have been giving his blessings to the younger". Respected Tauji also said "yes, Jagannath ji is right".